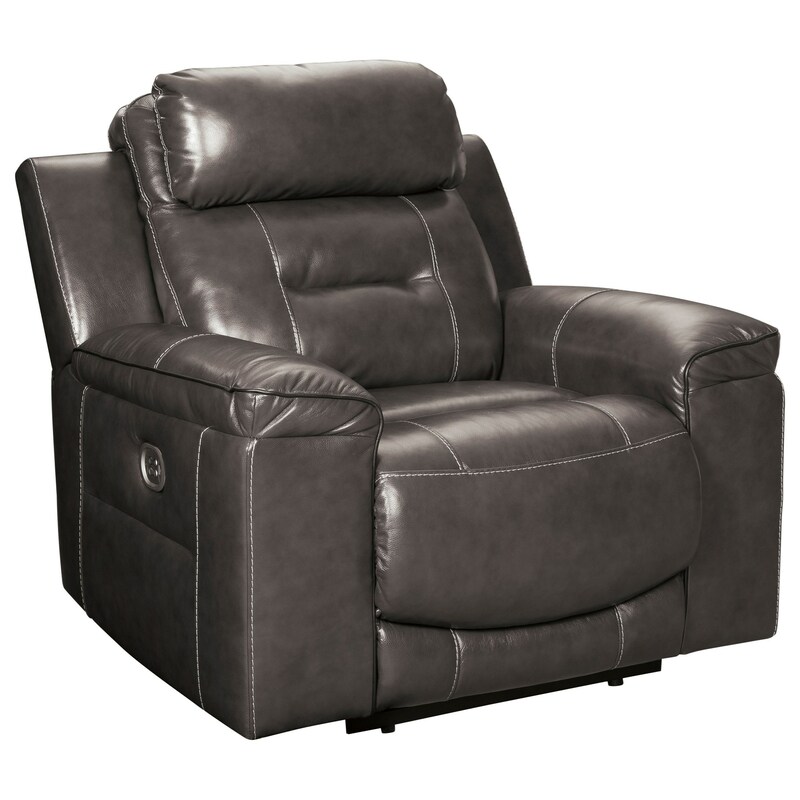 Customize your comfort with the EasyView™ adjustable headrest and power recline of this leather match recliner. The contemporary lines and accent stitching of the recliner will add style to your decor. A built-in USB charger in the power control even makes it easy to keep your devices charged. The Pomellato Contemporary Leather Match Power Recliner with Adjustable Headrest by Signature Design by Ashley at Miskelly Furniture in the Jackson, Pearl, Madison, Ridgeland, Flowood Mississippi area. Product availability may vary. Contact us for the most current availability on this product. Fabric Content Top-grain leather in the seating areas with skillfully matched faux leather upholstery everywhere else. Recliner Mechanism The power reclining mechanism features infinite positions for comfort. Recline with the touch of a button, adjust the headrests, and enjoy the luxury of the leather match upholstery with 100% top-grain leather in the seating area and matching vinyl on the back and sides to keep the price affordable. A pillow top headrest and line tufting contribute to the contemporary style of the pieces available. The Pomellato collection is a great option if you are looking for Contemporary furniture in the Jackson, Pearl, Madison, Ridgeland, Flowood Mississippi area. Browse other items in the Pomellato collection from Miskelly Furniture in the Jackson, Pearl, Madison, Ridgeland, Flowood Mississippi area.